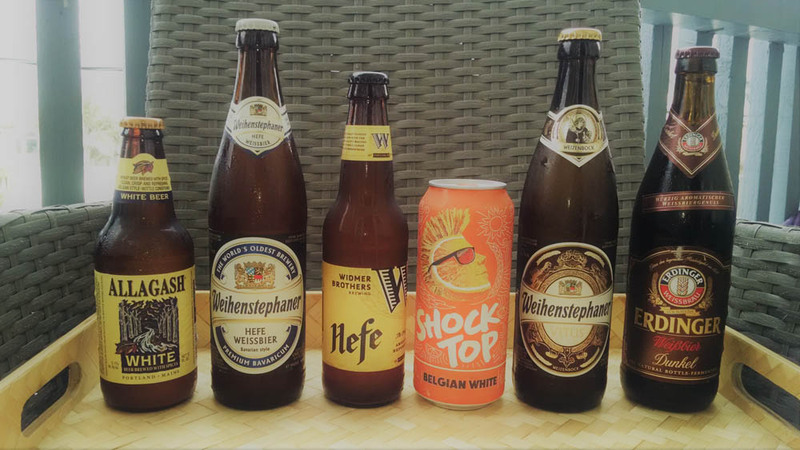 Hefeweizen, weissbier, witbier, white ale… Whatever your preference; wheat beers are abundant, effervescent, and different. They can be served with a slice of orange or lemon, with all the yeast “mit hefe” style, with raspberry syrup, or filtered crystal clear. They vary in color from the light witbier to copper-brown versions of weizenbock. They can smell and taste of: bananas, clove, coriander, bitter orange, and even bubblegum. These refreshing, mostly session strength ales are usually associated with summertime sunshine. However, there are a couple of higher ABV styles that would pair well with a cold evening by the fire. The typical wheat contribution to the grain bill can be as high as 70%, with rare exceptions like grodziskie (an oak smoked wheat beer) making up 100% of the grist. Wheat beers nearly went extinct in the 1500’s due to the Reinheitsgebot, the German beer purity law. The Reinheitsgebot stated that only barley, water, and hops could be used as ingredients to produce beer and thus prohibited breweries from using wheat, or other grains such as rye. According to a Brew Your Own article from 1999 the original purpose of the law is somewhat debatable. Certainly it was a consumer protection law to ensure people were in fact getting beer when they went to the local watering hole, but some sources claim it was meant to prevent a shortage of bread. Further down the rabbit hole of conspiracy is the idea that the pale white beers were only brewed by, and for, the nobles and clergy and not for the common man, who was left drinking the dark swill of the lower class. The law was later amended to include yeast, after its discovery. 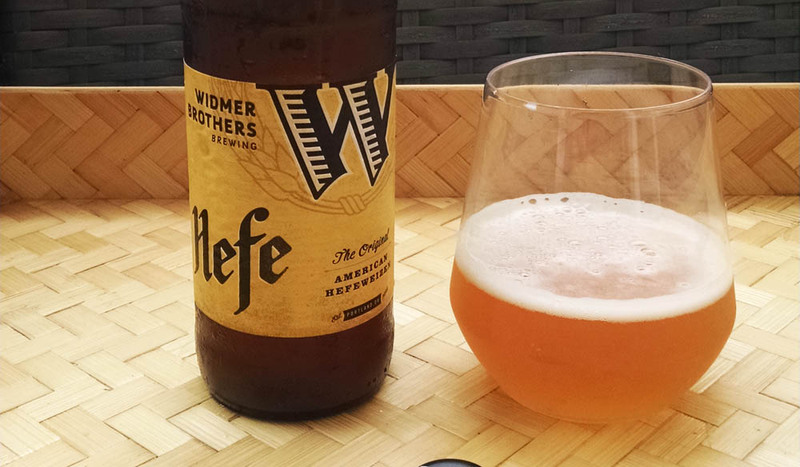 Wheat beers have become somewhat of an American spring and summertime tradition. They often were considered to be the jumping off point for those interested in expanding their palates to include more than mass produced lagers but lately it seems like that is more the space of the mass produced IPA . Be that as it may, for those of us who live in the permanent summertime of California, we still enjoy a nice crisp, refreshing wheat beer in the sun year round. If big beer had any sense they would take a hint from Corona and show Shock Top or Blue Moon being happily consumed on beach volleyball courts by freakishly tall men and women, at high noon. 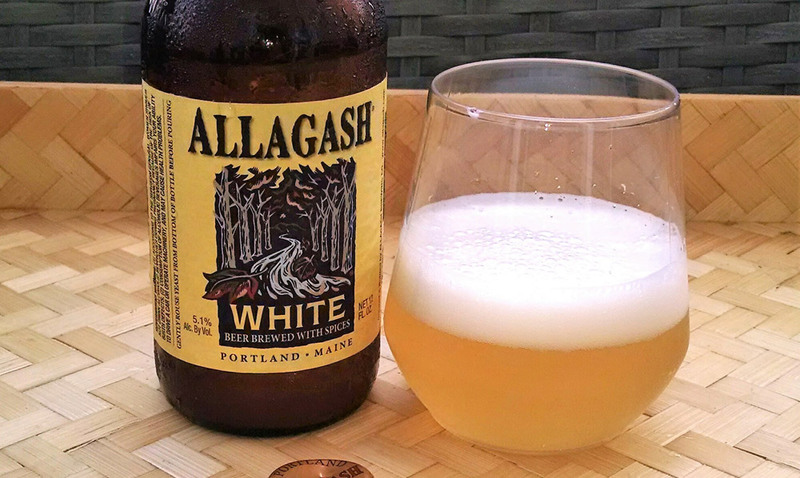 According to the BJCP (Beer Judge Certification Program), the standard guidelines for homebrew beer styles, Allagash White, along with Hoegaarden Wit, are prime examples of the wit style. Belgian Wits are generally brewed with 50% unmalted wheat and a light base malt like pilsner or 2 row pale. They can include oats to add to the haze and body. Noble hops are used to add a light bitterness, but nothing too noticeable, or overwhelming. Allagash White includes the traditional spice addition of coriander seed, which is the seed of cilantro that smells strikingly similar to Trix cereal. Allagash also uses the traditional curacao orange peel, which adds to that zesty zing in the aroma and flavor. I tried putting an orange slice to my pour and it was totally unnecessary. It added nothing to the beer and was ultimately just an obstacle in the drinking process. The beer is delicious on its own. Light, refreshing, nicely carbonated, and extremely flavorful. I did a side by side with the macro produced Shock Top and it was comparable to watching a cover band at the local dive bar trying to fiddle their way through a Led Zeppelin song. On paper they are the same. Belgian style beers brewed with coriander and orange peel, but the difference between the two is painful. My suggestion, as far as adding an orange for garnish in the Shock Top, is to disregard the beer, and eat the orange. Also, for anyone learning about off flavors, the Shock Top tasted like cardboard. Paper and cardboard are aromas and flavors commonly associated with oxidized beer. If you have a buddy that insists on drinking this farce of a Belgian Wit I suggest you sneak some Allagash White into his/her cooler at the next outing. They will thank you later. Have you tried the Hefe? The Weihenstephaner Hefe Weissbier, however, is very good. I never realized there was such a striking difference between the Belgian Wit style and German Hefeweizen. I always assumed they were the more or less the same, but different in small ways, like English Pale ale and American Pale Ale. I was wrong. 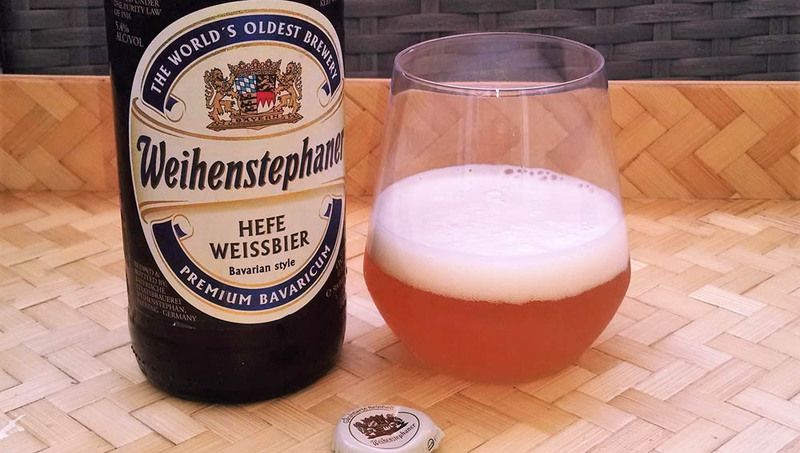 The hefeweizen is much less aggressive in its flavor and brewed with 50%-70% wheat. It is softer and seemingly more rounded. The 4-vinyl guaiacol which is responsible for the clove like aroma and flavor in the yeast is in the forefront while the beer also hits notes of banana with a hint of bubblegum on the nose and taste. There is little to no bitterness or hop presence and it is extremely drinkable. American wheat is one of those styles of beer that will forever be burned into my brain as uncool for reasons I don’t remember, but I don’t care, as I like it. I have vivid memories of my first times drinking these non-lager beers, after turning 21, of course. While going out to dinner with my mom, or my dad, I was quietly exploring beer menus and learning about the life I would lead after 40oz. malt liquor stopped being the norm. This was before IPAs became a staple offering at most establishments and back when hefeweizen just meant beer served with a lemon or an orange added on the rim. My memories include copious consumption of Widmer Hefe and Pyramid Hefeweizen. Since Widmer Hefe holds a space in my heart I opted to try it again to make sure it was still worthy. Upon revisiting it, the beer seemed dulled down, non-threatening, and different than I had remembered. It smelled like a hefeweizen, minus the yeast aroma, which is basically all the aroma of a hefeweizen. I went to their website to research if the recipe had changed or if my memories were better than the truth. Then as I entered my date of birth, and accessed the site, I saw a picture of the Widmer Hefe with a lemon garnishing the glass. That’s when I realized what I was missing. Having no lemons I opted for the trusty orange. I could have gone back to the store, but I had already had a tough enough time finding the Shock Top for this tasting. None of my go to stores carry it! I spend all this time seeking out small breweries and then when I need the macro stuff I can’t find it, go figure. Needless to say the orange brought the Widmer Hefe right back to where it was when I killed an oversized pitcher of it, at a burger shack, with my future wife, my mom, and my step-dad. This is one, of many, reasons American beer has had a bad rap for so many years. It is the dumbest dumbed down version of a true hefeweizen. The yeast is a clean ale yeast and everything about it is subdued. The BJCP states that the use of American hops and more hop character, in general, is desirable. Call me crazy, but with all these American hops floating around in our IPAs, there must not be much left for our American wheats, because even at 15-30 IBU’s they are gentle and lightly bitter. Dunkel weissbier is a dark German wheat beer that maintains the yeasty banana and clove flavor other German wheat beers while also having a toasted bread or caramel flavor from the use of darker Vienna and Munich malts. Traditionally a decoction mash was used. This is a process in which a portion of the mash is removed and then brought to a boil and then added back into the main mash to bring the mash temperature to different rests. Decoction mashing aids in the darker caramel flavors associated with caramelized sugars and the maillard reaction, but this is a method that is generally no longer used in commercial breweries. 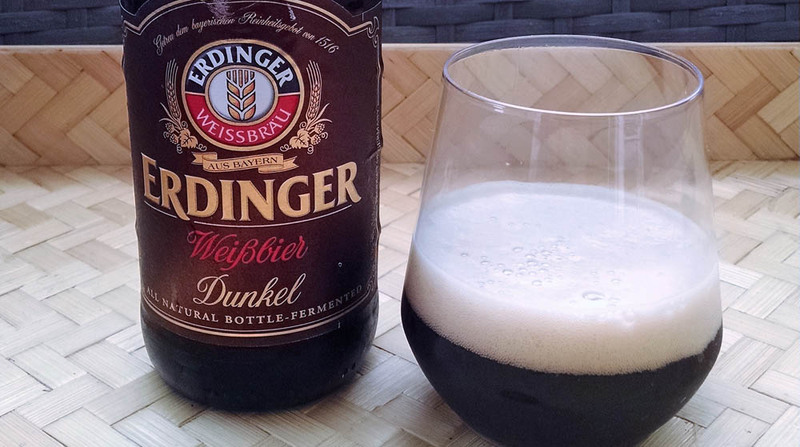 Low on bitterness and hop aroma, the Erdinger Dunkel is like a dark Hefeweizen with some additional bready and caramel aspects. Malty yet dry, it is a nice change of pace that is sure to please novice beer drinkers and nerds alike. Weizenbock is an obscure style that doesn’t come up in conversation too much. It is a sleeper and I’m sure once American craft breweries discover it they will be brewing it for their yearly holiday beer. It is similar to a hefeweizen, but stronger, bigger, and, some would say, better. It is like banana bread in a glass and can come in light or dark versions. The extra malt usage adds to the higher ABV of anywhere from 6.5%-9.0% it has even more of that banana and clove flavor. Dark versions will utilize Vienna and/or Munich malt and can have more dark fruit character like plums, prunes, or raisins, and even a light chocolatey, but not roasted, flavor. 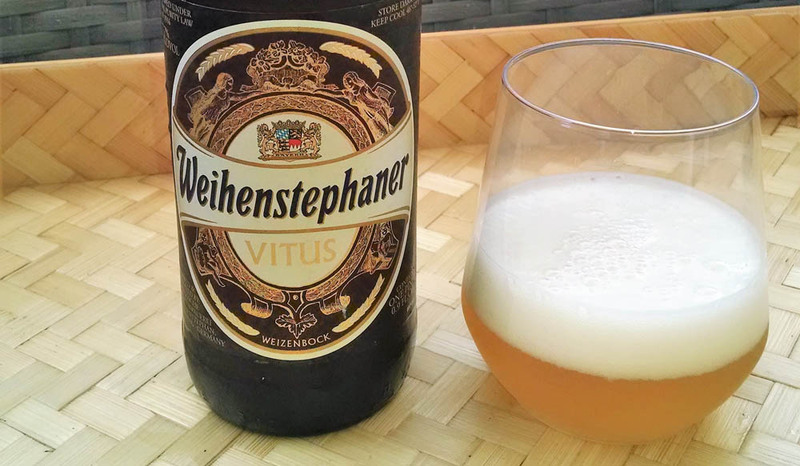 I opted for the light version brewed by Weihenstephaner called Vitus. This is a good winter warmer for anyone looking to break from the traditional imperial stout or barley wine. I imagine it going great with some chocolate dessert by a roaring fire while the snow falls. Unfortunately, living in Los Angeles, I may never get to test my theory. I have, however, had an imperial stout on a cool 80 degree evening, so there’s that. The classic Berliner Weisse, from none other than Berlin, is a low ABV sour that dates back to the 16th century. It is often served with raspberry syrup or with woodruff syrup to round out the mouth puckering tartness. The Berliner Weisse uses as little as 25% wheat in the grain bill, but at around 3.0% ABV. that is more than enough. During fermentation lactobacillus bacteria is introduced to create the tart, distinct sourness. It is an extremely low hopped beer in the single digit IBU range, which is evident in the lack of bitterness and hop aroma. These beers are around, but they are nowhere near as popular as they were at their peak. They are meant to be consumed young. Even with the recent interest in sour beers, some travel and effort may still be necessary on your part to find a prime example of a Berliner Weisse. Lambic is spontaneously fermented wheat style that originated in Brussels region of Belgium. The beer utilizes hops that are 2-3 years old and an open overnight cooldown that exposes the wort to all the microorganisms that will do the hard work of fermenting, and souring the beer. Once cooled and exposed the wort is transferred into wooden fermenting vessels such as barrels where more wild yeast and bacteria are living and eager to feast on the fresh wort. They will remain in the vessels for at least one year and sometimes for several. Word on the street is one must travel to Brussels, specifically Brouwerij Cantillon, to try them. After a few years in barrels older Lambic is blended with younger Lambic to create Gueuze. Which is bottled and then carbonated unlike the base beers, which are served with no carbonation. These highly sought after blends are still going strong in breweries such as Cantillon and can be found, in rare instances, on strong (read: STRONG) beer menus and at well curated bottle shops. Fruit Lambic is another variation. Coming in varieties such as: kriek (cherry), frambroise (raspberry), or pomme (apple) as well as others, the fruit lambic is traditionally made by adding fruit to the year old Lambic and essentially creating a secondary fermentation which is then bottled and carbonated. Once again, look to Bouwerij Cantillon in Brussels for prime examples of this style. If you know someone who knows someone maybe you can secure a bottle for a rainy day, or better yet, a hot summer swelter.